The REAL “IRON MAN” from Indonesia! How many of us could really have the power and courage to fight disability? Or more, put in efforts, enough to overcome it! Doesn’t such a person deserve a huge round of applause! Here’s the story of real life Iron Man – both physically and at heart. Definitely, the story of this Indonesian welder is a motivation for all of us. His courage and hard work have paid him well. Who is this “Iron Man” from Indonesia? Kompas TV shot a video of a man in Bali. He has been reported to control a ‘robotic arm’ with his brain. Woah! Definitely technology overload! I Wayan Sumardana of Karangasem, Indonesia, has become famous as the “Iron Man”. He used to work as a welder before an unfortunate incident occurred and things went out of control. It was just about six months ago that a stroke led to his left arm being paralyzed. Yet, as they say – where there is a will, there is a way! Unlike most people who would begin to curse situations and fate, I Wayan Sumardana, the “Iron Man” from Indonesia was determined to put everything back into place. With poverty spreading itself at home, he simply wouldn’t make excuses. In a short time of six months, he created a robotic arm using metal scraps and successfully hooked it up with his brain. Yes, he restored what illness took away! The functionality of this robotic arm is controlled by his brain and this allows him to continue working as a welder and earn the daily bread for his family. The story of this “Iron Man” from Indonesia was not only broadcasted by Kompas but also other prominent national news channels. Even Reuters has given it due significance by adding the video to its official website. Not to mention, there have been countless shares on social media as his story went viral. Quitting is easy; working harder to overcome problems is the difficult task. 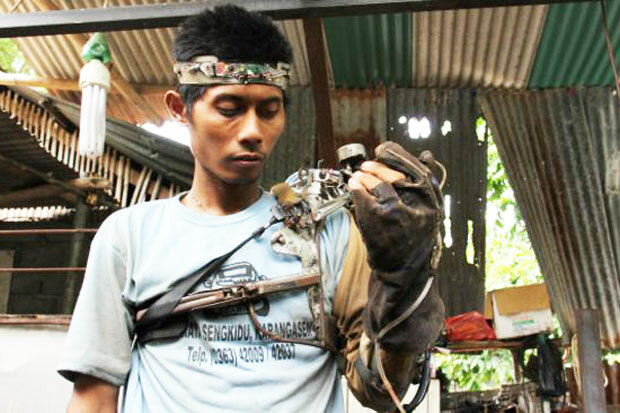 All of us must take inspiration from the story this “Iron Man” from Indonesia. If he can have the will power to stand strong and fight back against a serious medical condition like paralysis, then why do we call it quit when life throws challenges at us? We must have courage! It is a compelling narration. Resourceful problem solving intelligently put to use, to overcome an injury by a modest protagonist. Yet, we would prefer waiting for a more reliable confirmation of the reality of this science by experts. If it is really true that he can control the robotic arm with his brain, this is a commendable invention in itself, let apart the determination he displayed for overcoming this challenge in life. Better have it confirmed by experts rather than depending on the reports of Indonesian media about the ‘Iron Man from Indonesia’. Also, a simple engineering or scientific feat is not being appreciated here. As much as we would love it to be true, we must acknowledge that even the incredible Tony Stark is fictional.